Your ears naturally produce wax (cerumen) to protect the skin in your ear. This can sometimes build up and block your ear canal. itchiness in or around your ear. Do not insert cotton wool buds or similar objects into your ear to try to clean out the blockage. This can make things worse as the wax is often pushed deeper inside. Accidentally grazing your ear canal can cause an ear infection. Use ear drops instead. This softens the wax, allowing it to run out of your ear. You can buy ear drops at your pharmacy. Olive oil is a great alternative to ear drops. Simply place a few drops in your ear each day for three to seven days to soften the wax. You can use a teaspoon to apply the oil. Find out how to use ear drops in this leaflet. 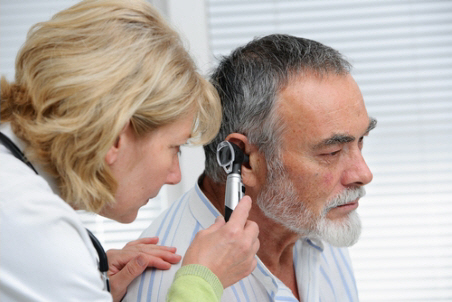 If ear drops don't fix the problem, you can ask your general practice about ear syringing. You can also contact an ear hygiene clinic that does ear microsuction. You will find many listed in the Yellow Pages. Ear syringing (pictured above) is where lukewarm water is squirted into your ear canal to dislodge softened wax, which then falls out with the water. Many nurses in general practices can perform ear syringing, sometimes with a machine that makes sure the water is squirted at the right pressure. You may feel some discomfort or dizziness during ear syringing. Ear syringing is only effective with softened wax, so before you book an appointment make sure you've used softening ear drops or olive oil in your ears for at least five days. Ear syringing is safe, but not quite as safe as microsuction. There is a small risk of infection or damage to your ear canal, or a perforated eardrum (a hole in the eardrum). Also, ear syringing isn't suitable for everybody, for example children, and people who have had a recent ear infection. Ask your nurse or doctor if ear syringing is suitable for you. With microsuction, a nurse uses a small microscope to look into your ear, and removes earwax with a low pressure suction tube. You may feel some discomfort, tickling, or dizziness during microsuction. How can I stop wax building up? You can reduce the need for syringing or microsuction by regularly using olive oil in your ears. Apply two or three drops in each ear once a week. This can be particularly useful if you use a hearing aid or earplugs. Avoid using cotton buds as this can push the wax deeper into your ears. A page explaining why earwax builds up and describing the different methods for removing excess ear wax. Written by HealthInfo clinical advisers. Page created October 2016. Community HealthPathways – Ear Wax retrieved October 2016.